Sometime around 300 BC, the Greek mathematician Euclid published a mathematic and geometric treatise entitled Elements, a collection of definitions, proofs, and theorems. Among its contents was the idea that two parallel lines will never intersect. Doesn’t matter how far you extend them, they’re never going to touch. Ever. Though he couldn’t prove it, for centuries this idea was taken as truth, as a rule. However, in the early 19th century, two other pioneering mathematicians—János Bolyai from Hungary and Nikolai Lobachevsky from Russia—said, “Hey, what if this isn’t true?” Their questioning, which showed that two parallel lines can in fact intersect, led to the birth of a new branch of mathematics called spherical geometry. There are many stylish gentleman who are more or less “by the book.” And there just as many who threw that book out the window. Agree? Who are some of your favorite rule followers and breakers? And finally, what’s your take? Are the rules of style made to be followed? Are they made to be broken? Or, are they simply guidelines that are open to personal interpretation? Well said!!! I think rules are guideline, but should be open to personal interpretation, if not we would all end up looking like each other, and self-expression would be lost. I personally, am a rule breaker in women’s fashion. The quirkier the better, not to the extreme of say someone like Lady Gaga, but I appreciate women who dress for themselves instead of following fashion blindly and end up looking like a fashion victim. Yet, in men’s fashion I absolutely adore a well dressed, perfectly tailored, clean cut look. I’m not a huge fan of flamboyance in menswear. Opposites attract I guess ;)! It’s great to have a woman’s perspective here. It’s interesting to think about what turns guys on about men’s style and what turns women on. One of the rules I read the other day from another blog is never wear a shirt with a tie without a jacket. I think they said that it makes it look like you’re a 8 year old at a wedding. That seems like a typical rule – but I just don’t agree with it. A great looking shirt, slim fitting pants and a beautiful tie can be sharp and stylish – not to mention, simple. Also, I’ll say this: the world is filled with guys who could care less about their style. I applaud anyone who is gutsy enough to not only care about their wardrobe, but to break the rules. It may work, it may not, but at least they’re not boring. One always has to have role model for inspiration, or dare I say a base to start from, I take inspiration from giving classics a twist, example I decided I wanted to learn to use a straight razor when people see me shave using a straight razor and brush their look is priceless!!!! One person I love tosee photos all the time for inspiration is Alain Delon and Brian you,ve also become an inspiration to many! Too kind, Jose. I’m still working on my straight razor technique! I appreciate those who have shared their understandings of fashion rules in books from the likes of Alan Flusser or sites like this one and dappered.com, as well as videos from Anonio Centeno. I think everyone should flex out the rules to their own style but they should first know the rules, whether that comes naturally and intuitively for some or research and experimentation for the rest of us life-long learners. Bam. Couldn’t agree more, Brett. Hi Brain. Firstly what a fantastic article, I don’t believe I am alone when I say that I have been waiting with bated breath for such a post from you. As you have probably noticed I am pretty opinionated when it comes to what I do and don’t like when it comes to fashion for both sexes, but when it comes to having ‘identity’ I believe it definitely should be each to your own… otherwise we would live in a society of Justin Beiber and Kim Kardashion clones. Saying that though, would you not agree that we need style ‘RULES’ as a basic foundation to build on. If ‘RULES’ did not exist then fashion would have no definition, no ‘black-tie’, no ‘smart casual’ no ‘morning dress’. Opinions are great, Terence. I’m a firm believer in knowing the basics then branching out from there. Doesn’t matter whether it’s style, music, or whatever. There are basic building blocks that serve to inform any decision you make once you have a firm grasp on that foundation. And a person who has that foundation can generally depart from the norm with ease. I always come back to music when I talk about style, but think about John Coltrane. When he released Giant Steps in 1960 he took the standard ii-V-I progression to another level and completely revolutionized jazz. It’s not a stretch to say that straight ahead jazz was never the same after that. Could that have happened if he didn’t understand basic Western harmonic progressions? Absolutely not. But the world adapted and expanded after that even though some weren’t ready for it. Seriously, though, listen to how much trouble Cedar Walton has trouble keeping up with the changes during his solo! Bending rules is sometimes okay in my book. But, some aren’t meant to be bent or broken though. 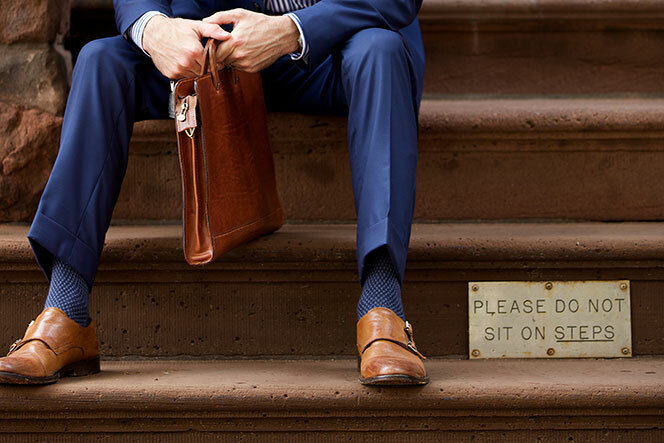 I’m a conservative dresser and have worked the footwear industry and the light brown monk straps with a medium blue suit in Brian’s photo above is a mistake in my book. The colors are complementary, but they jump out as “inexperienced” or “naïve.” I work in a state capital and see that look all the time on younger men. Shoes should be at least as dark as the suit regardless of color (try that suit with a mahogany or walnut shoe)! I know I’ll get flack for taking this position, but I like traditional/conservative fashion on both men and women. Nothing is sexier than a lady in a nicely tailored suit. No harm in having a taste for classic style and having a “way” to do things. A few other commenters mentioned the aspect of personal choice involved, especially if you are a student of style. And also, for me, there’s an aspect of what feels right to you. If you like the way it looks, wear it. Thanks so much for the comment, Benjamin, especially since you thought you’d get flack for it! But, see, you didn’t! Interesting topic. I agree there seems to be a divide between rule followers and rule breakers. Roughly speaking British Classic style could be considered an example of the former whereas Italian style arguably could be taken as an instance of the latter. While for a british gent style is almost a matter of complying with a strict code, and to him that’s the beauty of it, italians are more inclined to innovate and to rule breaking. I also contend that American East Coast style lies somewhere in between. It’s a matter of personal choice to decide which school of style to follow, or none of them. Finally, I believe rule breaking is also a subtle part of style even for strict code followers. Maybe the late Duke of Edinburgh is the best example of this. But breaking rules as he did is a difficult skill, one that paradoxically is probably reserved to those who have a full commeand of the rules. Great to hear from you again, Carlos. What is the world if we don’t have competing opinions on everything?! Really love how you mention personal choice and subtlety in your comment. For me, subtle always equals stylishness. Cheers. Great article, my only question is – who makes those socks? Haha! Thanks, Adam. See below for sock info. Not sure if they’re still available or not. It seems the rules of dress developed alongside, or as part of, the rules of social etiquette. While we don’t slavishly follow the rules of etiquette, it is important to know them and to know when they should be followed and when they can be ignored. The same may be said of the rules of dress. It is necessary to know the rules to be able to decide whether and when you want to violate them. Purposefully ignoring or violating the rules may seve to set you apart as a well dressed person. Violating them out of ignorance may also set you apart, but not in the way one would wish. Extremely well said, Rocky. I really like the point you make about deciding to break the rules. Great comment. Liked the article – but where are those great socks from? Haha, they’re from Johnston & Murphy. I picked them up at a store about 2 years ago when they were having a big sock sale. I think style rules are guidelines to follow, and if you’re going to break them you need to know them beforehands. I also think someone like Matt Damon is someone who follows the rules but always looks good on the red carpet or just out on the town. I have trouble following guidelines for the length of a casual blazer or sport coat. When the bottom hem of a blazer hits my the middle of my palm at rest by my side it looks too long compared to the almost comically short blazers that I see on clothing outlet models and otherwise well dressed men. That said, I usually end up breaking he rule myself and buying a 44r when I should be in a 44l. Thanks for your posts, they are always informative. Ok, I guess a lot of people will hate me for this one but, I don’t follow the rule not “not matching the handkerchief to the tie”. Although I agree with a lot of rules (not more than 3 colors (breakable rule sometimes), lower button of the suit opened, not tie bar with waistcoat), I just can’t agree with this one. I just find it so nice when the tie matches the handkerchief. I think it looks nice, so I decide to do it anyways, even if it is a blasphemy to a lot of people. Please don’t kick me out of this website !